NEW figures obtained by The Detail show that the number of referrals to health trusts about potential risks to vulnerable adults and children here have increased dramatically in recent years. Child Protection referrals have doubled since 2006/07, while Adult Safeguarding activity has more than trebled since 2009/10. However, charity groups and policy makers say they still don’t know if this latest trend is evidence that the systems in place to identify risks have improved or if it is an indication that there are more cases than ever before. The new Safeguarding Board for Northern Ireland (SBNI), which is due to become operational later this month, will for the first time bring together key agencies from the voluntary and statutory sectors to work strategically to protect and safeguard children and promote their welfare. In an exclusive interview with The Detail, the incoming chair of the new SBNI, Hugh Connor, says there needs to be greater analysis of the systems in place across Northern Ireland to identify the true meaning behind the referral figures, as well as the inconsistencies between each trust. The data on Adult Safeguarding activity was provided by the Health and Social Care Board (HSCB). It relates to adults who are elderly, have mental health problems or suffer from a learning or physical disability. Not all referrals will necessarily result in the development of a protection plan but each is subject to investigation and pending any accepted risk, a protection plan is then put in place. The circumstances can vary from reports of physical abuse, to a failure on the part of a carer to provide timely medication; it can involve the theft of money and personal belongings, or relate to some form of bullying. As previously reported by The Detail, in 2009/10 there were a total of 1,184 referrals to trusts about potential risks to adults across the four categories of adult care and 750 cases in which trusts put in place a protection plan for an adult who was considered as having been at risk. The latest figures for 2011/12 show that there were three times as many referrals amounting to 3,586 and twice as many protection plans implemented with 1,640 in place as of March 31 2012. Across the five health trusts, the largest number of referrals were made in relation to the care of the elderly with a total 1,715 referrals. 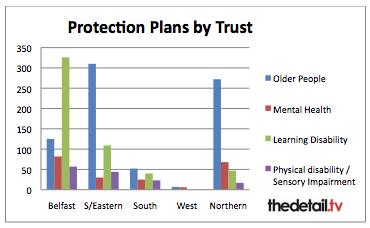 Similarly the data shows that the most common protection plan implemented during 2011/12 concerned the care of the elderly, making up almost half (714) of the overall figure for protection plans. The South Eastern trust had the majority of these with 310. Patricia Donald, chair of Age Sector Platform, believes more work needs to be done to identify why the increase has occurred. She said: “The figures released showing the dramatic increase in the number of referrals and protection plans put in place for vulnerable adults, demonstrates the scale of this problem. Whether these rises are down to increased reporting due to more confidence in the system and better awareness is unclear. The Belfast HSC Trust had the greatest number of protection plans overall, with half of the referrals deemed serious enough to be re-classed as a protection plan following further investigation. A breakdown of protection plans for each trust shows that the single largest number of plans for one category occurred in the Belfast Trust and related to the care of those with learning disabilities (514). In the original data sent to us by the HSCB it stated that the Southern Trust had no protection plans in place despite having over 850 referrals during 2011/12. When we contacted the Southern Trust on this matter they clarified that there was in fact 140 protection plans implemented across the four categories of adult care between April 2011 and March 2012. Maureen Piggot, director of learning disability charity Mencap, believes the rise in referrals is reflective of changes made to the system. She said: “This system is relatively new and that’s why I think that the increases that we are seeing are due to the implementation of a new way of working, a new system, new arrangements in place and new awareness of those arrangements. However she acknowledges there is a need for further scrutiny of the increase. “All figures need to be interpreted. They don’t tell a story on their own and I think that the questions you are asking are valid questions. The people who are in a better position to answer it are social services who are actually putting the plan in place and they would have a sense in terms of their normal practice about whether or not there is abuse or whether it is an increase in reporting and an increase in awareness. Child protection referrals relate to cases where there are allegations or suspicions of child abuse involving children across the care spectrum. This is not a list of abused children but of children who are subject to an interagency child protection plan. When a referral is made discussions will take place within 24 hours between the police, social services or the NSPCC in order to plan the way forward. The first stage of the initial multi-agency assessment must take place within a maximum of seven working days. Where cases progresses to a second stage, a Child Protection Case Conference is convened. Here a decision is made about whether or not to place the child’s name on the Child Protection Register. The register is a confidential list of the names of all children in the trust area who have been abused or who are considered to be at risk of abuse, and are currently the subject of a child protection plan. In 2006/07 there were 2,829 referrals made to the Child Protection Register, over the next year the merger of the new health trust boundaries was implemented and by 2007-08; there were 3,071 child protection referrals made. 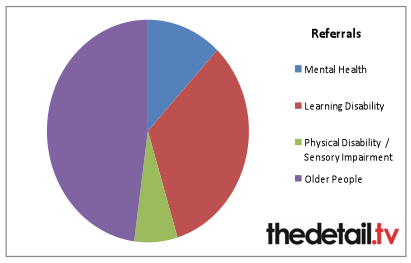 In a Freedom of Information request we asked the Department of Health for a full up to date breakdown of referrals made to the child protection register by year and source of referral. The figures show that between 2007/08 and 2010/11 the number of referrals had risen from 3,071 to 4,804. 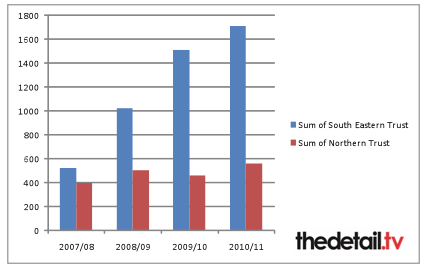 The largest increase between 2007/08 and 2010/11 came from the South Eastern Trust where there has been over a three-fold increase in referrals, from 524 to 1,713. Despite the Northern HSC Trust covering nearly 100,000 more people than the South Eastern Trust, its referral rate is three times lower, with 565 referrals in 2010/11. 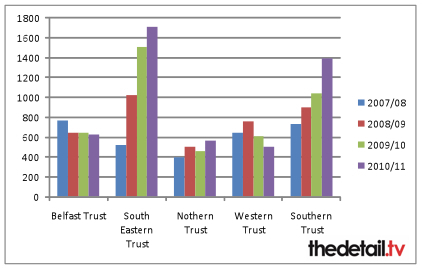 There was also a rise in referrals in the Southern Trust while referrals in the Western and Belfast Trusts have fallen. The source of referrals has changed over the last four years. The figures show that hospital referrals have increased by 52% from 99 to 150 and referrals from voluntary organisations tripled from 17 to 54. However there was a decrease of 43% in school referrals falling from 418 to 241. 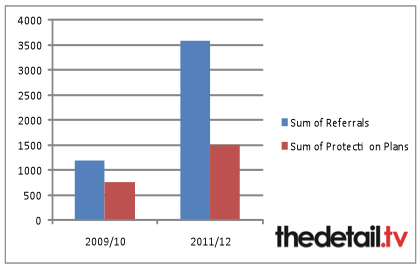 There were over 600 referrals made by police in 2010/ 11 compared to just 399 in 2007/08. 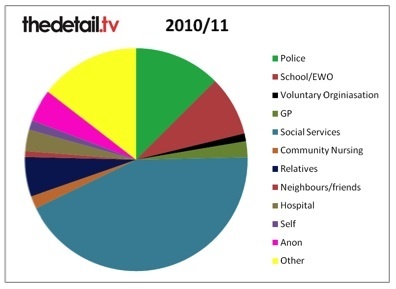 The highest number of referrals were made by social services which have more than doubled from 1,128 to 2,073. Dr John Devaney is from the School of Sociology, Social Policy & Social Work at Queen’s University in Belfast. He believes the figures reflect improved training for professionals and the change of culture within these systems in recent years. He said: “There has been considerable investment in child protection training for professionals who see children and families regularly, such as police officers, teachers, health visitors, doctors etc. “For example, the police now routinely refer on all reports of domestic violence when they know there are children living in the family and a large number of child protection referrals are made by social workers themselves about children they are already working with. A briefing paper to the Northern Ireland Assembly on child protection register and referral statistics from March 2012 was inconclusive as to whether or not trusts higher or lower levels of children on the Child Protection Register was a positive or negative sign. In a statement to The Detail the Department of Health said: "There are a number of factors to explain the increase in Adult and Child Protection referrals, including increased awareness to refer, improved collection and processing of information or an actual increase in incidents. In recent years the Office of the First Minister and Deputy First Minister (OFMDFM) and the DHSSPS say they have taken steps to strengthen levels of support and protection for vulnerable children in Northern Ireland. Membership of the new Safeguarding Board for Northern Ireland will include officials from the PSNI, Social Services, Youth Justice, Probation Services, District Councils and range of professions who work in child protection. The Safeguarding Board will be officially launched at Stormont on September 18. In his first interview as incoming chair of SBNI, Hugh Connor told The Detail that examining the variations between the levels of referrals and register would be a top priority. He said: “Basically what we need to do is look at how the various agencies operate across the province, using the trust boundaries you have and the figures you have. We need to look and see if those individual systems are working well. “I think we need to make sure there’s greater consistency and greater standardisation while allowing for the fact there need to be local solutions to local needs. “The new Safeguarding Board will have strategic responsibility for ensuring that the work of our members are coordinated, but I think it’s wrong at this stage to draw too strong a conclusion from purely quantitative data. “For example there may be some areas which will have stronger community and voluntary support than others which could affect the figures. On December 31 2011, 2,173 children were listed on the Northern Ireland Child Protection Register, with a total of 4,804 referrals made during 2010/11. A breakdown of the rate of child protection registration between each of the trusts over the past four years paints a picture of inconsistency. Dr John Devaney says these figures suggest a more complicated system whereby each trust has its own unique set of circumstances. He said: “Some of it is to be expected with higher levels of social deprivation increasing parental stress, and the levels of social deprivation differ within and between trusts. But there are also other factors such as the availability of community services and voluntary organisations that can reduce parental stress and compensate children. “It is also likely that trusts operate in slightly different ways in how they define a child protection referral. For example a child who discloses sexual abuse appears to be a clear case, but when does parental drinking become concerning?